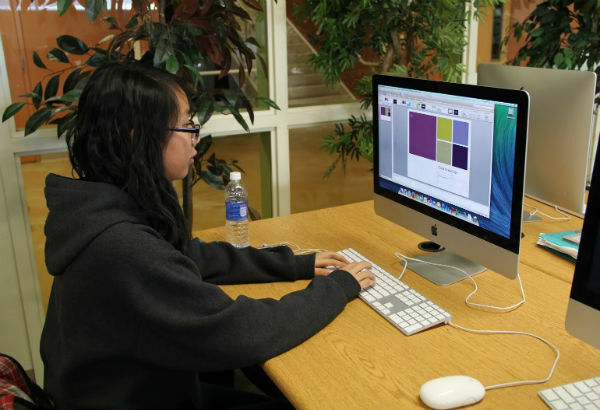 Freshman Francesca Ngo discovers different features of PowerPoint. This application along with others were made available to students on Jan. 1. “Microsoft helps a lot with my schoolwork. I use it on a regular basis,” Ngo said. Beginning Jan. 1, Office 365 Education is now available at no cost for active secondary students enrolled in the Clark County School District (CCSD). “If you didn’t have PowerPoint at home this makes it so that you can work on assignments outside of school versus only having to be on a computer here,” Educational Computer Strategist (ECS) Stacy LeFevre said. Due to CCSD’s Microsoft Office license renewal, students are able to download Office 365 for free through a volume license, which combines purchases together. “They had X amount of students and X amount of dollars, which was only enough to cover those in the school district currently,” LeFevre said. Applications that are included are Word, Excel and PowerPoint. OneNote and Outlook are only available for download on Apple iMac computers, while Publisher and Access are only available on Personal Computers (PCs). “Office 365 is about 100 dollars online so I’m grateful we get it for free. I plan on using the programs to help me with my school work,” junior Andy Landaverde said. To download the software, visit portal.office.com. The username is the individual’s student ID followed by @ad.ccsd.net. To log in, the user must type the password they created at the beginning of the year for the school computers. “Even though I use Google Docs and Drive for most of my schoolwork, I’ll be using Word for assignments that need me to make pamphlets or letters because it would be easier than doing it by hand,” junior Gierael Ortega said. Each student is limited to downloading the programs on a maximum of five devices; However, installing different languages of each application does not count against the installation limit. “Microsoft Office being free for students is really useful especially because I can download it on all of my personal devices. It’s a tool that any student, like myself, can appreciate,” sophomore Shawn Wang said. Additionally, this software is also available on mobile devices such as iPads, iPhones, Androids and tablets. “I usually don’t bring my laptop to school, so being able to download Microsoft Office on my iPad makes it easy for me to create a document and work on it in school and then go home and continue my work,” senior Tiffany Dang said. Hi, I’m Acel Soriano and I’m a senior in the Respiratory Therapy program. I am currently serving as the news editor for the 2015-16 school year.